Ontario, Canada’s second largest province and home to the Great Lakes, is possibly one of the best places to see in Canada. Whether you’re an adventure junkie or more of a laid-back traveller, there are a variety of attractions in Ontario to suit everyone’s fancy. While this eastern province may not come across as a fun place to explore, it’s actually quite the opposite! Read on to see my top recommendations on where to go in Ontario. If you’re wondering where to go in Ontario for a quiet getaway, Sault Ste Marie is the place for you! This city, located on the St. Marys River, is one of the oldest European settlements in Canada. The city itself is charming with a mix of historical and modern architecture. One of the top attractions I’d recommend is the Agawa Canyon tour train ride, offering breathtaking views of the Agawa Canyon. Train rides not your thing? There is still plenty to do here! Sault Ste Marie offers a variety of attractions for the whole family. If you’re visiting during summer, go canoeing or kayaking down Sand River or Dog River. When summer temperatures soar, you can also cool down at one of the waterfalls nearby. During the winter months, snowmobiling is also a fun activity to try out–just be sure you’re covered with the appropriate snowmobile travel insurance! Located on the St. Lawrence River, the Thousand Islands are an archipelago made up of over 1,860 islands. There are plenty of things to do while visiting this area. But be warned, the most popular attractions are the numerous cruises offered throughout the day. These cruises sail through some of the most scenic backdrops in the province. Depending on the cruise, you’ll sail past historical lighthouses, beautiful castles, and impressive island mansions, while hearing fascinating tales of the past. If you’re looking for a leisurely vacation, a cruise around the Thousand Islands is an amazing experience! If cruising isn’t for you, there are also plenty of water sports and activities you can partake in. Seeking adventure? You can go scuba diving and explore eerie underwater sites–just remember to look into travel insurance for scuba diving if you’re visiting from out-of-province. Prefer being on the water instead? You can also drink in the scenery while kayaking down the river. Whichever activity you choose, there’s little chance you’ll regret visiting this beautiful place! Looking for a rare and different experience? The Lift Lock cruises in Peterborough are one of the most unique attractions in Ontario. Located in southern Ontario on the Trent-Severn Waterway, these cruises are serene, beautiful, and fascinating. Unlike other river cruises, you’ll sail along the Trent Canal on different levels, experiencing another vantage point of this remote location elevated on a boat lift. These historical lifts are the highest hydraulic lifts in the world and are designated as a National Historic Site of Canada. Peterborough is possibly one of the best places to see in Canada, thanks to this truly unique experience! 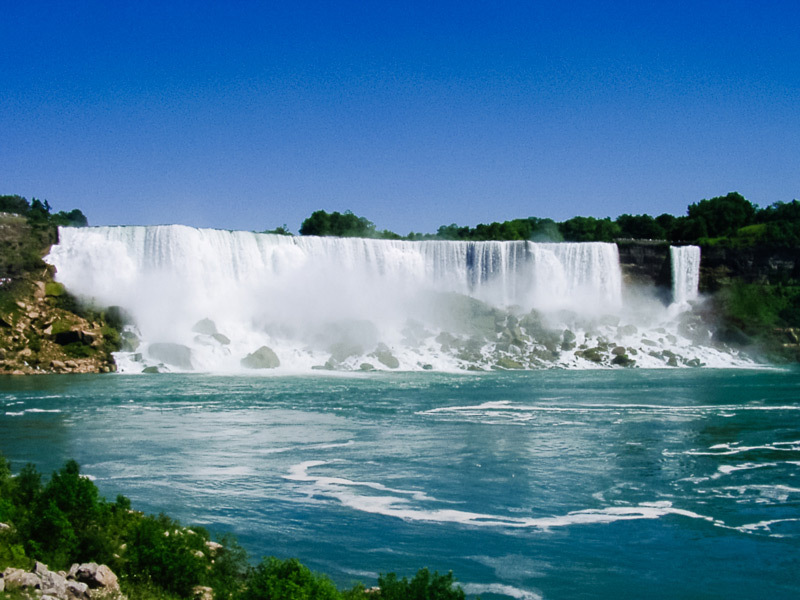 Of course, one of the most popular and must-see attractions in Ontario are the world-famous Niagara Falls. Although it’s a popular tourist attraction, these falls are truly spectacular! While there, I’d highly recommend purchasing a ticket for a Maid-of-the-Mist tour. These boat tours bring you right to the bottom of the falls offering you a unique and exhilarating perspective of their beauty and might. A word of advice: bring a change of clothes—you’re going to get wet! While I haven’t personally experienced this, there are also helicopter tours offering aerial views of these majestic Falls. 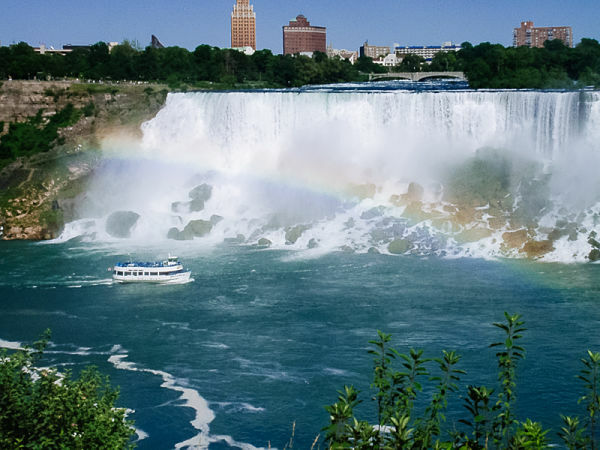 There are also many things to do in the area, to keep you entertained aside from viewing Niagara Falls. If you’re visiting with kids, I’d suggest checking out the Ripley’s Believe It Or Not museum– an old but fun attraction. These are only of the few attractions in Ontario that I’ve visited. However, I’ve also heard great things about Cottage Country—another popular destination, as is Algonquin Provincial Park . Ontario is truly one of the best places to see in Canada, so I’d recommend that you make your way there sooner rather than later! Remember, planning a hiccup-free trip starts with a solid travel medical insurance policy. When I travel, even within Canada, travel insurance is always on my list. Keep in mind that provincial health care only covers you to a certain extent, if you’re outside your home province. So, it’s best to purchase travel medical insurance to make sure you’re fully covered, if there are any mishaps. And if you’re planning a road trip and renting a car, take a look at these 5 car rental and insurance tips!